Former pharmaceutical chief executive Martin Shkreli has been suspended from Twitter after allegations that he harassed journalist Lauren Duca. Mr Shkreli drew criticism in 2015 when his firm, Turing Pharmaceuticals, hiked drug prices. Twitter confirmed to the BBC that his suspension was related to Ms Duca's case. A spokesman said Mr Shkreli was "not stalking or harassing anyone" and hoped his account would be reinstated. Previously, Ms Duca had tweeted a screenshot of an invitation from Mr Shkreli to Donald Trump's inauguration. Her response, which she posted to Twitter, read: "I would rather eat my own organs." Following this, Mr Shkreli posted a tweet calling Ms Duca a "cold you know what" and published some doctored images of himself and Ms Duca together. He had also changed his Twitter profile to read "i have a small crush on @laurenduca" before the suspension. "Martin is hoping that the suspension of his Twitter account will be temporary as the facts sort out," said a spokesman. "He was not stalking or harassing anyone with his tweets but using the platform as a legitimate means to communicate directly, which he does regularly. "He is not a social media stalker and fully respects the rights and privacy of anyone he communicates with." 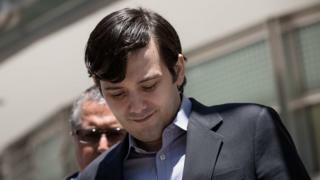 Mr Shkreli came to widespread attention after his firm raised the price of Daraprim, used by many Aids patients, from $13.50 (£11) per pill to $750. He was arrested in December on allegations of securities fraud and stepped down as the head of Turing Pharmaceuticals. His trial is scheduled to begin on 26 June. The BBC has contacted Mr Shkreli for comment.